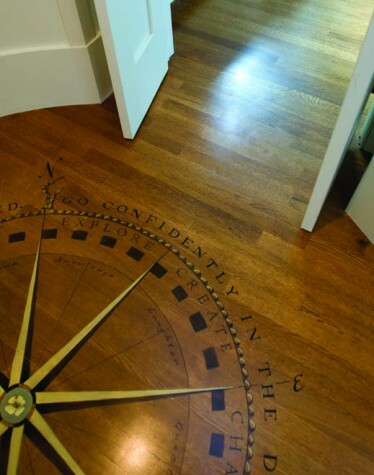 While the homeowners sought seaside-inspired interiors, there was to be nothing nautical or hokey about the decor. The seaglass-blue linen sofa matches the painted island as a nod to the adjoining kitchen, and the authentic pond boat “floats” behind it, a willowy reference to their love of sailing. The family room’s bank of four double-hung windows frames the trees outside. Above the mantle in the family room off the kitchen is a painting called Heartfelt Memory by Eugene Horne. It is framed by items from the homeowners’ collection of small architectural models. A large custom island in the kitchen by Maine Coast Kitchen Design and Indisco Kitchens and Baths provides ample work space. Banks deliberately limited the number of upper cabinets to keep the view uncluttered. 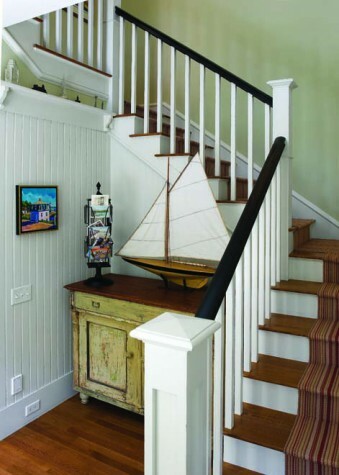 Tidewater Millwork crafted the cabinetry with minimal hardware in an old-fashioned painted finish in off-white. 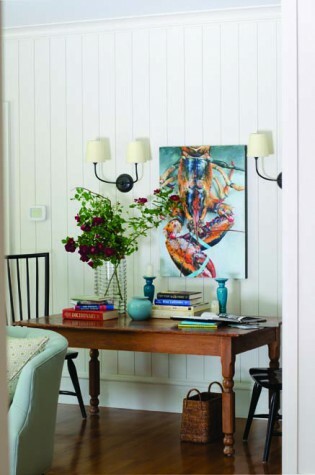 Big Lobster by artist Linda Dahlke hangs between two sconces in the family room off the kitchen. 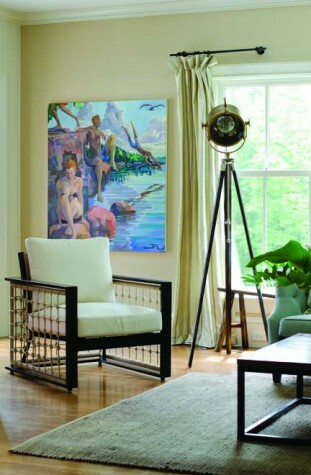 Nickel-gap paneling provides a neutral backdrop to the artwork throughout. To keep the house within the setbacks and maximize space, Banks designed an octagonal dining room that cantilevers out. The red walls are a bold contrast to the white woodwork. 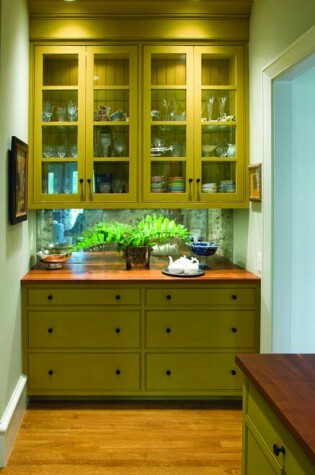 A peek of the butler’s pantry between kitchen and dining room reveals milkpainted yellow cabinetry by Tidewater Millwork. As a habit, Banks likes to incorporate two staircases into her floor plans: a front one and a back one. 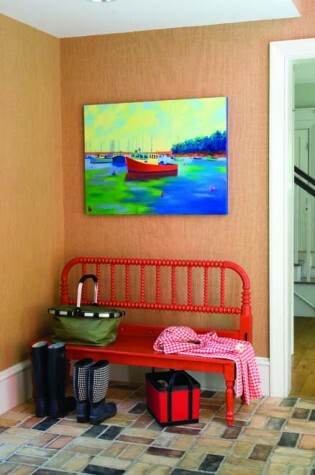 This front hallway features a painting called Down Bay View Street by artist Colin Page. 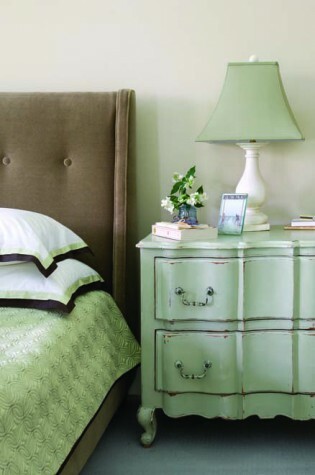 In the master bedroom, salvaged antiques mix with a contemporary palette. The homeowners wanted an iconic front porch. 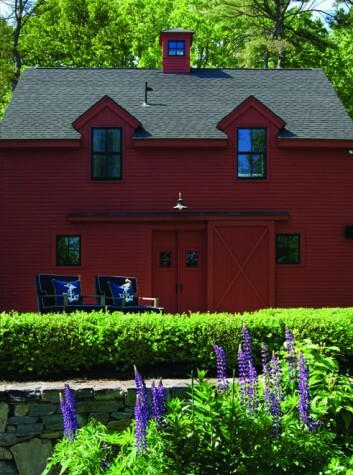 The black painted windows are an update to the classic New England style. The homeowners are self-proclaimed “architecture junkies” who are as passionate about art as they are about the outdoors. They hit it off with Banks immediately. “The first thing I did,” recalls the designer, “was ask them things like ‘Where do you put the Christmas tree? How do you entertain? Are you indoors or outdoors people? Summer or winter? Sit-down or buffet? '” Their answers, and the discussion that followed, helped shape the master plan for Banks and Cape Elizabeth builder Craig Cooper of Rainbow Construction. 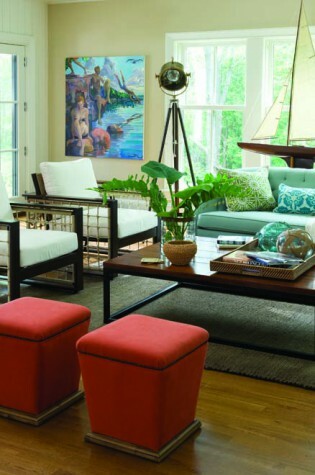 The homeowners, who were moving from Virginia, made it clear that they weren’t looking for a summerhouse; they wanted an everyday house-house, a place with plenty of space for their two children, dogs, extended family, and collection of artwork. More specifically, their wish list had three major nonnegotiable requirements: a new home that looked like it had been there for years, an open floor plan, and one that allowed easy movement between indoors and outdoors. While this was the first time Cooper and Banks worked together, they quickly learned that they “spoke the same language” and shared similar goals for their clients. Rainbow Construction has a team of accomplished finish carpenters, several of whom have worked with Cooper for more than 20 years. Banks had big ideas, and this highly experienced crew turned out to be the perfect fit. Many designers have signature styles—unmistakable personal imprints that expose their involvement in a project. And Banks has a well-stocked arsenal: kitchen doors that lead directly to a patio (the “hamburger door,” she calls it), symmetrical kitchen cabinets, transition rooms in lieu of hallways, nickel-gap paneling, thick walls between rooms, double staircases—the list goes on and on. Another one of her philosophies that informed the floor plan for this house is the special separation of nighttime and daytime functions. 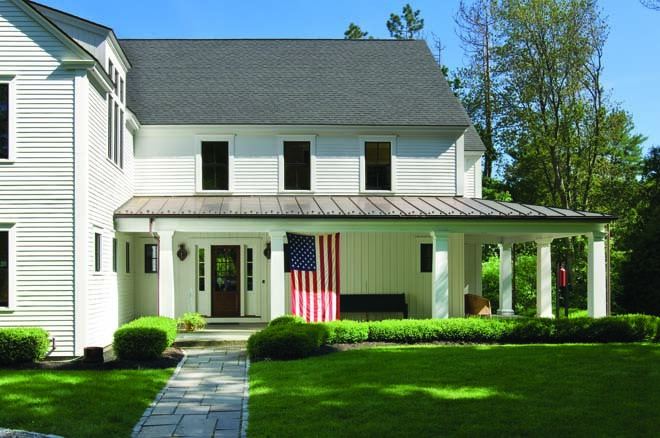 “I try to factor in where most of the activity will be taking place during the day versus the night,” she explains, “and then create the floor plan to follow.” In this case, Banks oriented the daytime spaces—kitchen, family room, mudroom, and terrace—toward the ocean views, and located the nighttime spaces—living room, dining room, and bedrooms—in an L-shaped layout on the inland-facing side of the home. “We appreciate that Linda’s design, while being relatively open, also provides areas that are ‘apart,'” says one of the homeowners. An example would be the library, where the family can escape for quiet moments. “Due to the design, you can have a noisy group in one part but still find solitude in the other, allowing everyone their own space and atmosphere,” he says. And with a playroom over the garage as well as an in-law apartment, even visitors can retire to their own private accommodations when they choose. The articulation of distinct features continued on the exterior design. Taking cues from the “big house, little house, back house, barn” philosophy, Banks used ascending gables to break up the massing of the house. 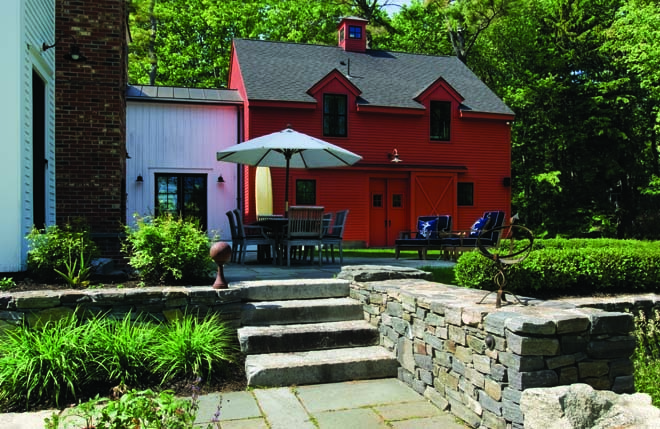 “There’s a high point, a medium point, a low point, and the barn,” she explains, “so the roof lines are all the same pitch but their different heights articulate the main mass, the secondary mass, and the tertiary mass.” By changing the height of the ridgelines and creating a cluster of gables, the house has the appearance of being added onto over the years. And by segregating the barn with a strong red paint, Banks visually separated it from the main home. 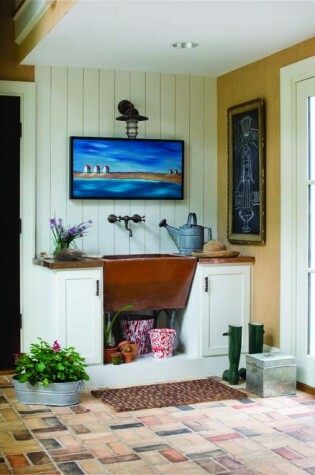 A transparent mudroom, ten-feet deep and two-stories high, is the connecting thread that links the barn with the main house. The combination of these elements makes the house more accessible and contributes to the feeling that it’s been there for a long time. The open floor plan is perhaps most evident in the combined family room and kitchen, a space that, according to the homeowners, has become the go-to gathering place for almost every get-together, from pre-prom parties to fundraising events. But the open plan is manifested in smaller, less obvious areas as well, for example, the “Mary Poppins” room outside the children’s bedrooms (another Banks signature), and a round vestibule between the adult wing and the children’s wing that Banks calls a poche (or “pocket” in French)—it’s the kind of architectural feature that you might find carved into a cathedral. 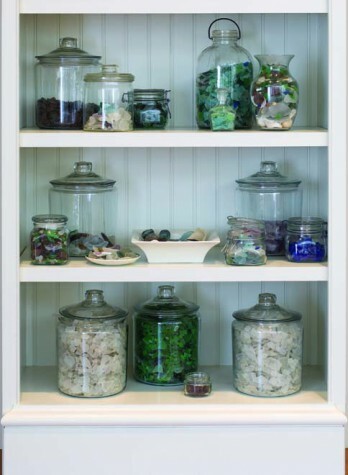 The butler pantry provides a similar effect, connecting the family room and kitchen to the more formal areas like the dining room and library. 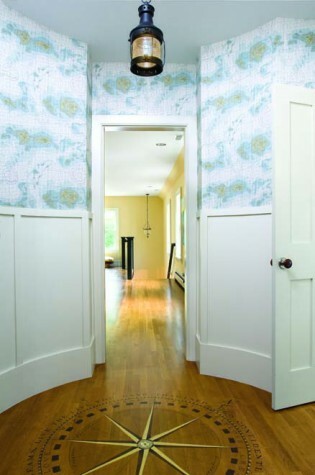 These smaller rooms have big jobs: they create graceful transitions between rooms in place of hallways. 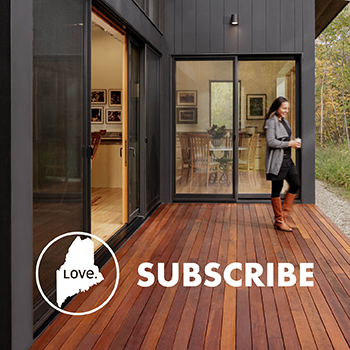 “They give the house a great flow and feeling of spaciousness,” says the homeowner. While the exterior is indeed beautifully spare with crisp lines, the interior is a vibrant mix of color that is grounded by classic white woodwork. 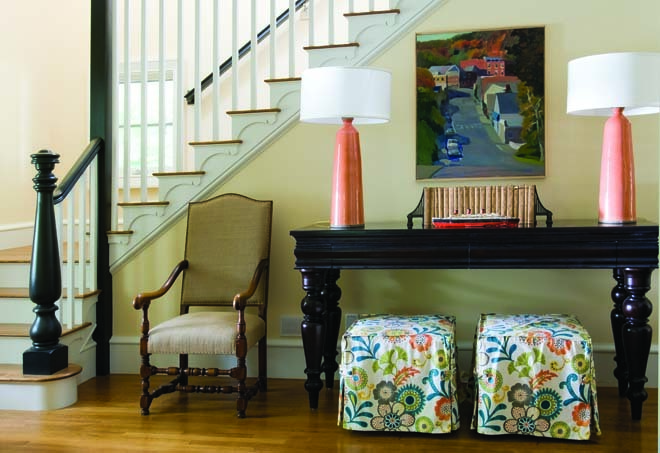 The homeowners have a preference for strong colors, and they chose bright hues that beautifully offset their artwork. 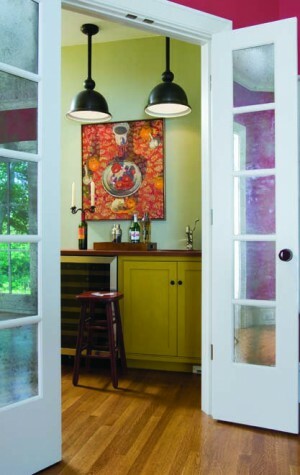 The pantry between kitchen and dining room created by Alex Hamilton of Tidewater Millwork, for example, was painted using buttercup-yellow milk paint. And the octagonal dining room makes a statement with its red walls. 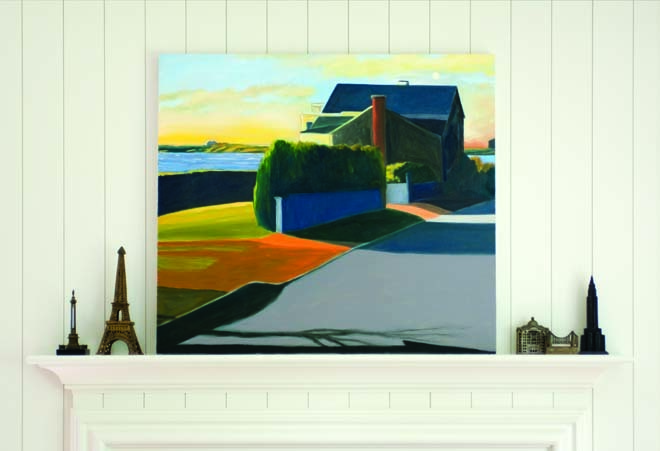 Throughout the home, the art collection, much of it from Maine, is on display, so that moving through the house feels like moving through a gallery. We have an intense interest in spatial design, both interior and exterior. We have explored that through the design and construction of two houses within 5 years. 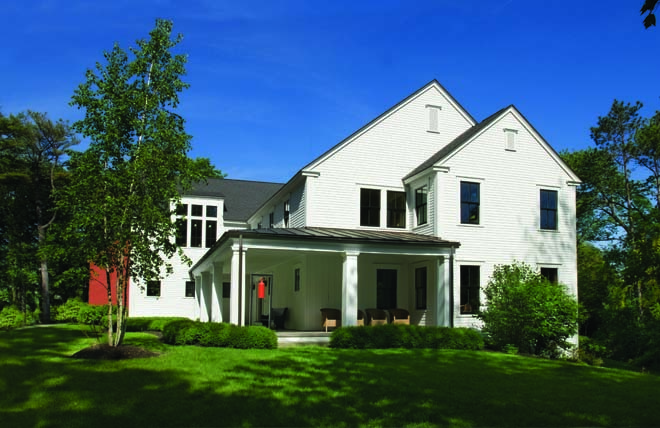 Having built a new home in Charlottesville, Virginia just three years prior, we were comfortable/familiar with the design/construction process. The combination of two very creative people in designer (Linda) and builder (Craig) working together to solve the many translation issues going from blueprint to actual house was among the more enjoyable parts of the process. Their flexibility and knowledge, as well as their ability to work as a team, was the single greatest contribution to a successful final product. People say our house has great “bones”, and while the interior can be styled a million different ways, the underlying design skeleton makes for a great platform. S.P. Plumbing & Heating, Inc.